1. First Team AHL All-Star Mark Mancari netted two goals and added two assists as Portland kept its season alive with a convincing 6-2 win at Binghamton. 2. Marco Rosa broke through with a goal and two helpers to lead Manitoba past Hamilton, 5-4, and cut the Bulldogs’ series lead to 2-1. 3. Former Calder Cup Playoffs MVP Steve Begin registered his second multiple-point effort in the last three games, netting the game-winning goal and adding two assists as Milwaukee topped Houston, 2-1. Charlotte looks to send Wilkes-Barre/Scranton to the brink of playoff elimination tonight when the teams collide at Time Warner Cable Arena for Game 4 of the East Division Finals… After splitting the first two contests in northeastern Pennsylvania, the Checkers returned home and snagged a 2-1 overtime victory in Game 3 on Monday… That marked the Penguins’ first road loss of the postseason, their first overtime setback of 2010-11 and their first-ever defeat in Charlotte, as they had taken all four regular-season visits to Time Warner Cable Arena… Checkers forward Brett Sutter potted the game-winning goal at 5:40 of the extra session on Monday with assists going to AHL All-Rookie forward Zac Dalpe and Jacob Micflikier, and it improved Charlotte to 2-0 in overtime games this postseason… In all six of Charlotte’s playoff victories thus far, the game-winning goal has come in either the third period or overtime… Sutter now has 3-2-5 in his last five games, and Dalpe has registered a point in five of his last six outings (1-4-5)… Nick Dodge, who notched the Checkers’ other goal in Game 3, has scored in all four home playoff contests thus far, and his four playoff tallies (4-2-6) are just one shy of the five he totaled (5-8-13) in 57 regular-season games in 2010-11… Charlotte goaltender Mike Murphy (5-2) stopped 26 of 27 shots on Monday; among AHL postseason goaltenders, Murphy ranks third in save percentage (.933) and fourth in goals-against average (1.98)… Chris Collins initially gave the Penguins a 1-0 lead in Game 3, and Wilkes-Barre went on to lose its first game this postseason when scoring the first goal (5-1)… Collins has now scored in back-to-back games after going his first seven playoff outings without a goal… Tim Wallace earned an assist on the Collins goal and shows 1-4-5 in his last four games… Wilkes-Barre netminder Brad Thiessen made 21 saves but fell to 5-4 in the playoffs; the AHL’s 2010-11 goaltender of the year, Thiessen has allowed a total of only eight goals in his four setbacks… Each of the Penguins’ four playoff defeats to date has been by either a one- or two-goal margin… Charlotte is a perfect 20-for-20 on the penalty kill at home in the postseason, and its overall success rate of 93.2 percent (44-for-47) is tops among the remaining playoff squads… The Checkers have also killed off seven consecutive 5-on-3 situations. One night after getting back into the series courtesy of a 5-4 win, Manitoba tries to even up the North Division Finals when it hosts Hamilton at the MTS Centre for Game 4 tonight… The Moose have struck for the first goal in all three contests thus far but finally cashed in for a victory on Tuesday… Manitoba’s top line of Marco Rosa, Jason Jaffray and Sergei Shirokov – held scoreless through the first two games of this series – combined for seven points in the Game 3 win, including a three-point effort by Rosa (1-2-3), who now boasts a team-best 10 assists and 15 points through 10 games overall… Shirokov (6-3-9) and Jaffray (3-5-8) rank second and third on the club in postseason scoring and each chipped in a goal and an assist on Tuesday… Rookie forward Jordan Schroeder, who registered three goals and six points in six playoff games for the Moose last season after coming out of the University of Minnesota late in the year, netted his first goal of these playoffs in Game 3… It marked the former first-round draft pick’s first tally since scoring vs. Texas on Mar. 18, snapping a 17-game dry spell… Alexandre Bolduc also scored for Manitoba, giving him a goal in three of his last four games (3-0-3) after failing to register a goal in six straight to begin the playoffs… Manitoba’s power play had been just 2-for-40 (5.0 percent) in the postseason prior to going 2-for-3 in Tuesday’s victory… Conversely, Hamilton’s penalty kill had entered the night 39-for-40 (97.5 percent) for the postseason… Bulldogs goaltender Drew MacIntyre had allowed only 13 goals on 216 shots (.940) in his first eight postseason outings, but surrendered five goals on 28 shots (.821) in the Game 3 loss… ’Dogs rookie forward Gabriel Dumont boasts three goals in his last two games, and leading scorer Nigel Dawes (6-5-11) picked up an assist on Tuesday to run his points streak to six games (4-4-8), the longest active streak in the AHL… Aaron Palushaj has a point in four of his last five games (3-5-8) for Hamilton, and defenseman Frederic St. Denis has found the scoresheet in three of his last four (1-2-3)… The Bulldogs are just 1-3 on the road this postseason, compared with a perfect 5-0 mark at Copps Coliseum… In last season’s playoff meeting between the teams, Hamilton also won Games 1 and 2 at home before Manitoba bounced back with a Game 3 victory in Winnipeg; Game 4 that time around went to the Bulldogs in double overtime. The Portland Pirates kept their hockey season going Tuesday night. Led by forward Mark Mancari and goalie Jhonas Enroth, the Pirates staved off elimination with a 6-2 win at the Broome County Veterans Memorial Arena. The Senators hold a 3-2 lead in the best-of-seven series that resumes Friday night with Game 6 at the Cumberland County Civic Center. The victory came 24 hours after Binghamton skated to a 6-1 victory in Game 4. Jhonas Enroth admittedly felt a little rusty when he made his first appearance of the Calder Cup playoffs. The form that allowed him to go 9-2-3 with the Buffalo Sabres this season was more evident Tuesday night in his second start and third postseason appearance with the Portland Pirates. Enroth made 35 saves to help stop the Binghamton Senators 6-2 in Game 5 of their Calder Cup playoff series. The Ottawa Senators have asked defense prospect Jared Cowen to bolster the Binghamton Senators in their pursuit of the American Hockey League’s Calder Cup. Cowen, whom the Senators selected in the first round (ninth overall) of the 2009 NHL entry draft, had a strong season with the Spokane Chiefs of the Western Hockey League, but his junior season – and most likely his junior career – ended Monday, when Spokane was eliminated from the playoffs. It would be easy for there to be friction between Charlotte Checkers goalies Mike Murphy and Justin Pogge. Pogge started the first two Calder Cup playoff games. Murphy then returned from a concussion, has started the past seven games, looked sharp and will be in net tonight for Game 4 of the East Division finals against the Wilkes-Barre/Scranton Penguins. But Murphy and Pogge, opposites in size and playing styles, have become fast friends this season, urging and pushing each other on. One by one they walked out of the visitors’ locker room at the Time Warner Cable Arena, just down the hall from the big metal door with the logo of the NBA’s Charlotte Bobcats on it. Some were joining a soccer game near the Zamboni chute. Some were getting in a stretch. Some were headed to the ice to participate in an optional skate. They all had the same mantra running through their heads. “We haven’t played our best hockey yet this series,” head coach John Hynes said. 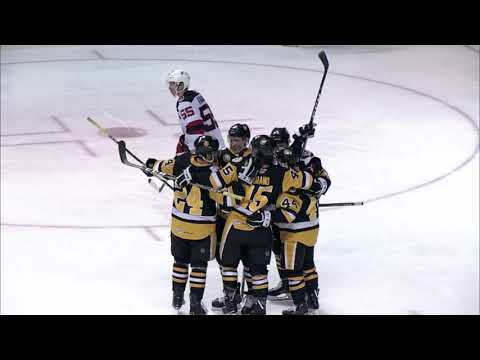 Some of the key moments in the Penguins’ victory over the Norfolk Admirals in the first round of the playoffs came before the games even started. Led by winger Geoff Walker, the Penguins engaged in a war of words with several Admirals players during warm-ups prior to Games 3 and 4. That ratcheted up the intensity in the series, which benefitted the Penguins, who seem to play better when games are chippier. After Monday’s 2-1 overtime loss to Charlotte in Game 3, Wilkes-Barre/Scranton Penguins head coach John Hynes said his players weren’t moving their feet enough – they weren’t skating like they should be. But there were a few exceptions. Forward David Marshall was one of them. Marshall, who is appearing in his first AHL postseason, has plenty of reason to keep his feet moving. Sergei Shirokov knew the Manitoba Moose needed to get their power play going to continue their stalled run to the Calder Cup. Shirokov and teammate Marco Rosa did something about that Tuesday, each scoring with the man advantage in Manitoba’s 5-4 win over the Hamilton Bulldogs in American Hockey League playoff action. They were the first power-play goals Manitoba has scored in the North Division best-of-seven final, which Hamilton leads 2-1. Score first. Give up second. Rinse. Repeat. For the third consecutive game, the Manitoba Moose managed to score the first goal in the North Division final against the Hamilton Bulldogs. And for the third consecutive game, the Bulldogs scored the next goal, then the one after that. Only this time, the Moose found a way to buck the trend, scoring twice in the final minute of the second period to breathe some life into this best-of-7 series. There’s not a lot you can do in 34.9 seconds. Watch a TV commercial. Pour a drink. Count the Liberal seats in the next government. Or if you’re the Hamilton Bulldogs, you can have a pretty epic meltdown and lose the opportunity to grab a 3-0 stranglehold in the North Division Final. One of the more shocking half minutes you’ll ever see in a hockey game began when the Bulldogs surrendered the tying goal on a rebound. In last night’s Stanley Cup Playoff action, Adam Hall and Nate Thompson assisted on the game-winning goal by Ryan Malone as Tampa Bay grabbed a commanding 3-0 series lead in its Eastern Conference semifinal with a 4-3 win over Washington… Former AHL All-Star Ryan Kesler scored twice – including the game-winner at 10:45 of overtime – to lift Vancouver past Nashville, 3-2, in Game 3 of their Western Conference semifinal. 7.63 – Goals per game combined by Wilkes-Barre/Scranton and Charlotte during their eight regular-season meetings in 2010-11 (61 goals). 3.67 – Goals per game combined by Wilkes-Barre/Scranton and Charlotte through the first three games of their East Division Finals series (11 goals). May 4, 2010 – Gabriel Dumont and Olivier Fortier both scored their first professional goal in Hamilton’s 3-2 win at Abbotsford in Game 3 of their North Division final. May 4, 2008 – Kris Versteeg records a goal and an assist to lead Rockford to a 3-1 win over Chicago in Game 3 of their West Division final. May 4, 1989 – Randy McKay scores 3:05 into the second overtime period to give Adirondack a 7-6 win over New Haven in Game 1 of the Calder Cup Finals. May 4, 1973 – The Cincinnati Swords defeat Nova Scotia, 7-3, in Game 1 of the Calder Cup Finals, snapping the Voyageurs’ 12-game postseason winning streak. May 4, 1968 – The Rochester Americans win the Calder Cup for the third time in four years, finishing off the Quebec Aces with a 4-2 win in Game 6. Don’t miss a step on the road to the 2011 Calder Cup championship. AHL Live brings AHL action to your computer all season long with live video webcasts and highlights of every AHL game, as well as behind-the-scenes features and interviews in the Video On Demand section… Visit theahl.com or ahllive.com for details.